What you see here is not the entire usual picture, but the heart of it. 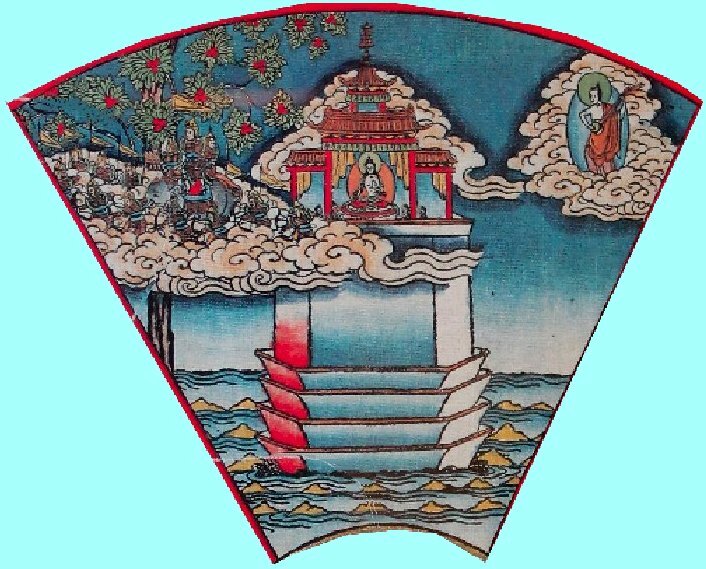 The bhavachakra presents us with an interesting combination of Buddhism and the conceptualizations of popular religion. The most characteristic part of it is its division into six wedges, representing six realms or stages of life. 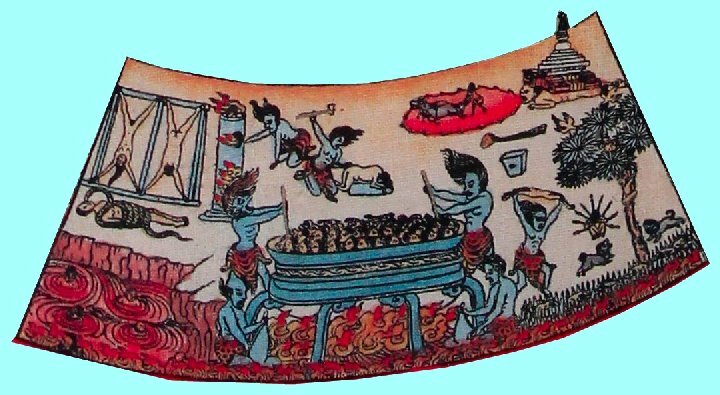 The wheel is being turned by Yama, the Hindu god of death. Other figures are possible, but Yama seems to be the most common one. 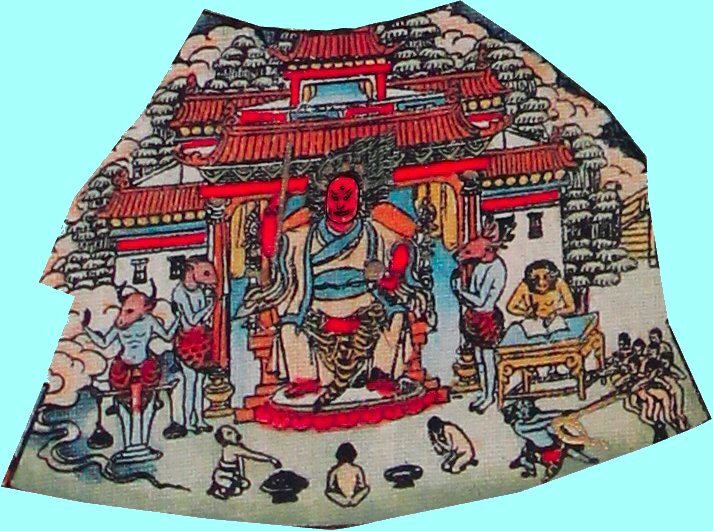 In Buddhism he represents the basic principle of impermanence. Let us assure you that nowhere on this wheel is a really good place to be. Some things at the very top of this wall hanging wouldn't have fit into the picture without losing too much the of the rest of the detail. Typically, in the upper left hand corner is a picture of the moon, representing nirvana, while in the upper right hand corner is a drawing of the Buddha pointing to the moon. 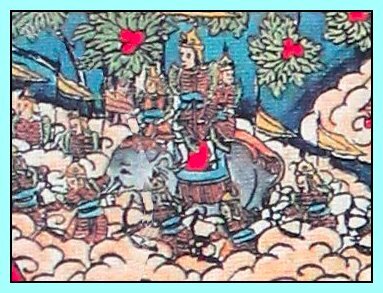 The idea is, of course, that the Buddha has shown the way to get off the wheel to Nirvana, where all of the suffering depicted underneath will end. 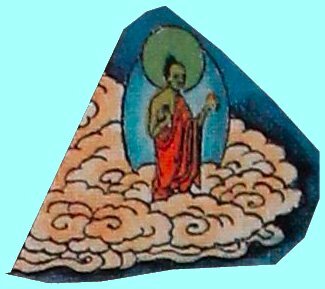 In some versions, rather than the Buddha pointing the way to Nirvana, a Bodhisattva directs us to the Pure Land So, here is a general schematic of the entire display. As to the twelve pictures in the outer circle, they are not all visible in the photograph. They are called the twelve nidanas. You can find them described in more detail in the Theravada section. Each element presents a necessary condition for the previous one. So, 1) depends on 2); 2) depends on 3), etc. To summarize, they are 1) old age, decay, and death; 2) birth; 3) becoming; 4) clinging; 5) desire; 6) sensation; 7) contact; 8) sensory faculties; 9) embodiment of an individual; 10) consciousness; 11) patterning; 12) ignorance. Once you have eliminated ignorance, you can eliminate patterning, which allows you to suppress individual self-consciousness, etc., until you have reached all the way down to eliminating suffering, viz. old age, decay, and death. So, the wheel of being begins with ignorance (avidya). 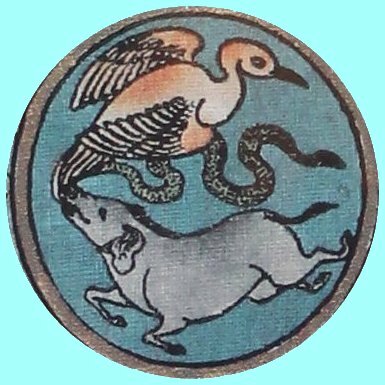 It is one of the "three poisons," which we find depicted at the center of the bhavachakra in the form of a pig. The other two lethal ingredients are attachment and aversion (hatred), pictured as a bird and snake respectively. Surrounding the three poisons is their inevitable consequence: karma, the force that propels us endlessly from life to life, which implies journeying from suffering to suffering. We see in the karma circle how people walk through life, appear to make progress, but eventually must fall downwards again. In certain schools of Hinduism and Buddhism, there may be favorable karma in a relative sense, but there is ultimately no good karma. 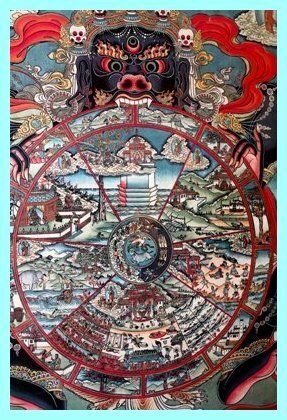 As long as you produce karma, you're stuck in the cycle of samsara. Take heaven, for example, located at the top of the wheel. Heaven would appear to be a very nice place to wind up. It is occupied by those beings who have accumulated so much merit that they were reborn as gods, by which term we can think of the Vedic devas. Their extremely long lives are given over entirely to pleasure (apparently including free elephant rides). But serious students of Indian philosophy know that spending time in heaven, even as a god, does not solve the problem of reincarnation and samsara. This is true in Hinduism as well as well as Buddhism. In the Bhagavad Gita, Krishna says that those who are faithfully fulfilling all of their obligations may spend some time in heaven (though he doesn't say as gods), but afterwards they must return to the same old cycle of lives again (BG 9:20-21). Buddhists have added another wrinkle to this piece of disappointing information. They reckon that, since the gods basically do nothing but pursue pleasure, when their time in heaven is up, they have absolutely nothing to show for it, and thus they get busted down to the very lowest realm: from gods to demons! 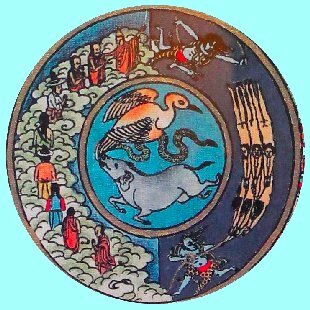 To the left of heaven on the wheel (from our vantage point) is the realm of the asuras, who are usually referred to as "demigods" in this context. In later Hinduism, they are usually treated as another kind of demons. Regardless, they are nothing if not enigmatic wherever they appear in the religions of Indo-European-speaking peoples. Run your cursor over the picture to get the full emphasis on the soldiers and the constant warfare they represent. Here in this Buddhist setting, as in various Hindu texts, asuras want to be supreme over the gods. They believe that they should rightfully be at the top, and so they spend all of their time fighting against the devas. The Hindu writings are filled with such stories, and Buddhists have carried on a large part of this tradition. The asuras represent constant dissatisfaction and the strife that results from it. As you can see, Buddhism is not atheistic in the sense of denying that there are gods. However, it maintains that the gods themselves, as well as the demigods, need to find enlightenment and release from samsara, but they neither know how to do so nor would they be able to bring it about. Flanking heaven on our right is the world of human beings. If this scene looks relatively serene and peaceful to you, you're reading it correctly. 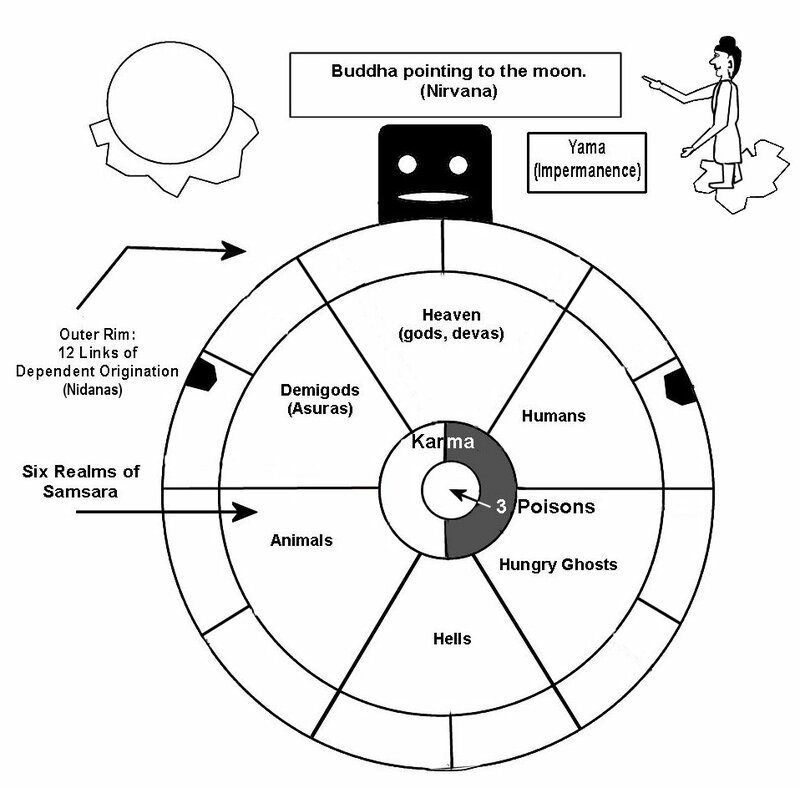 In contrast to the virtually frantic pursuit of pleasure by the gods and the paranoid warfare carried out by the asuras, human beings, though subject to suffering and various upheavals, are the only ones on this diagram to have the opportunity for reflection, meditation, and realization, so--for all practical purposes--they alone can make it to Nirvana. Still, as you must have noticed by now, each area includes the depiction of a Buddha or Bodhisattva preaching to its inhabitants. 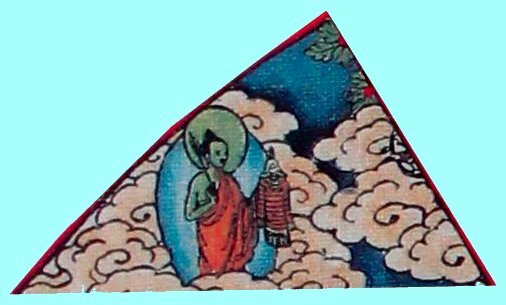 After all, in the Mahayana tradition, any sentient being can attain Buddhahood. So, there is no place where the dharma is not being taught, but that does not mean that the beings can or will respond. Right below the demi-gods (bottom left) are the animals. Keep in mind that these are beings who also exist within the constraints of karma and samsara. 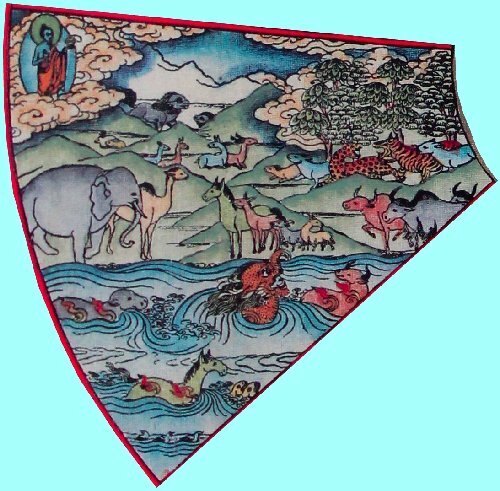 Any animal we encounter may be a human person working their way back up the ladder of incarnations towards the human realm or may have recently received a serious demotion because of poor karma resulting in bad karma fruit. Here, too, a deity is preaching the dharma to those who dwell on this level. 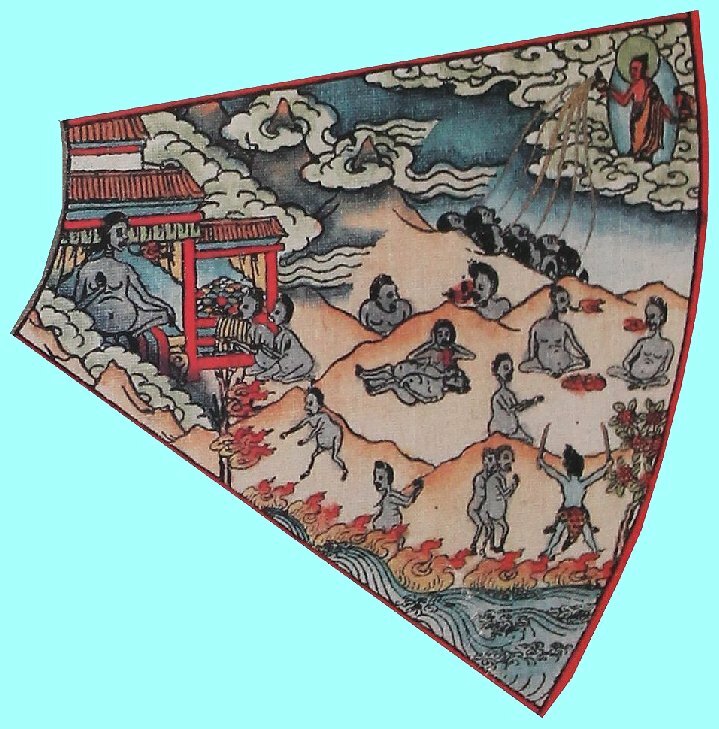 Opposite the animals are the "Hungry Ghosts." These are beings in torment. The original concept of a "hungry ghost" stems from China, where it refers to ancestor spirits who were not cared for properly. For example, they did not receive their appropriate food-and-drink offerings. Thus they were literally "hungry" and "thirsty." Consequently, they regularly emerge from the underworld at their appropriate time (around late August each year) to help themselves to whatever they may have been deprived of--and perhaps add a little revenge. So, in China Hungry Ghost Festival is a time when people (particularly older sons) go to particular lengths to make sure everything is square with their ancestors. Special offerings and rituals are performed, and free entertainment is provided for the roaming ghosts at roadside stages (wayang). Tibetan Buddhism adopted this concept, but gave it a particularly Buddhist aspect. In Tibetan Buddhism, Hungry Ghosts are persons who in their former lives were totally motivated by their carnal desires. Now they exist in a state where they feel the never-ending craving for some food and water, but have access to neither. Note on the picture that they have huge bellies, but straw-thin necks, so that they cannot even swallow liquids, let alone solid food. The necessary provisions are there, but they cannot get to them. They are so thirsty that flames come out of their open mouths, but there's nothing they can do about it, except to wait to be reincarnated out of this realm, which may be billions of years from now. But note the compassion of the Buddha or Bodhisattva figure: he pours some kind of refreshing liquid into the mouths of those willing to come to him for aid, so that at least the flames are doused. And then there is hell. Or, we should say, there are the hells. There is no question that we are now looking at religion on the popular level. The number of hells is supposed to add up to eighteen, and we appear to have a full complement here. 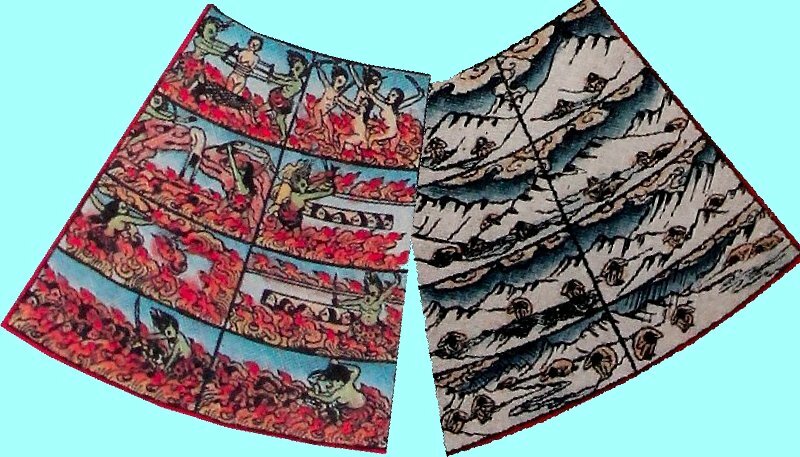 The two most populated areas are the eight fiery-hot hells (bottom left) and the eight icy-cold hells (bottom right). Front and center at the top is the entry hall, and below it we find the very popular conception, in which hell is a place where demons perpetually torture the souls of the condemned. Please don't even think to ask whether the Tibetan Buddhists picked up this notion from Christianity. It is not a Christian idea, i.e. in the sense of being based on the Bible. Nowhere in the Bible is there any concept of hell as a place where demons punish wicked people. That there was some influence from extraneous medieval European sources seems unlikely; perhaps, theoretically, someone in Tibet saw some paintings by Hieronymus Bosch, but we seriously doubt it as a serious suggestion. To get back to the picture, as mentioned above, this area is flanked by the hot and cold hells. And in the diagram we see the large reception area above those areas of torture. The souls of the people come across the bridge to the right. For the last part, they are being towed in by a demon because they are obviously resisting entering this place. Since procedure must conform to protocol, they are checked in by the figure sitting at the table on the right, who is apparently entering their names in a notebook. Then their karma is measured in the presence of the King of the Underworld. During a lifetime, a person is constantly accompanied by two spirits, a good one who keeps a record of their good works and an evil one who tracks their bad deeds. Both of these options are represented by pebbles of different colors, black ones for the evil works, white ones for any good ones. Together they add up to the present state of the person's karma. The two spirits place their accumulated pebbles into the bowls with the concerned subject sitting helplessly in the center. The good spirit is obviously highly distraught. There is not much white to see in her bowl, while the arrogant-looking demon keeps piling on the black pebbles. The new arrival can look forward to a long time of suffering in hell until the ongoing cycle will finally allow some relocation. One consolation is that the only departure from this realm constitutes an improvement of sorts, but the hungry ghosts are certainly not much happier. Still, again you can see a Buddhist divinity preaching to a few souls in hell, offering them release. It's unlikely that anyone is going to take him up on it. One might ask how one can reconcile the depiction here with the accounts of the Bardo T�tol, the "Book of the Dead." 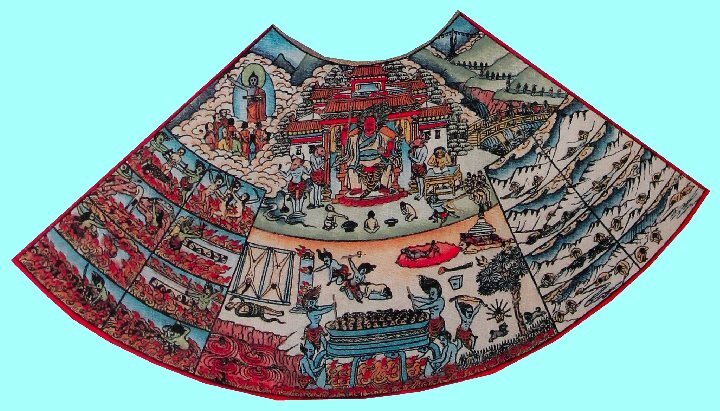 The latter was written from a far more sophisticated Buddhist perspective than the graphic representations of the bhavachakra. 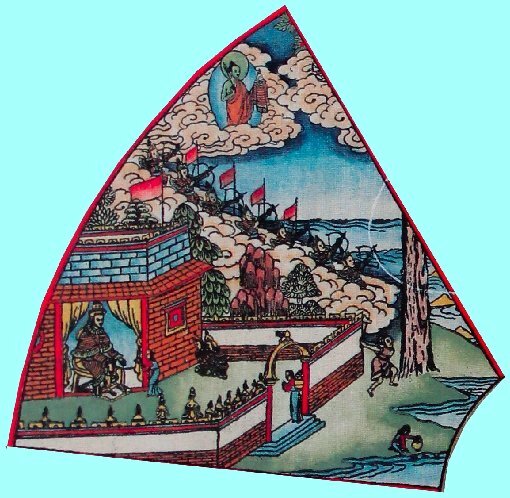 There the goal was enlightenment and nirvana, whereas here, on the popular level of lay people, the focus is on compiling enough favorable karma to advance to higher stations on the wheel. 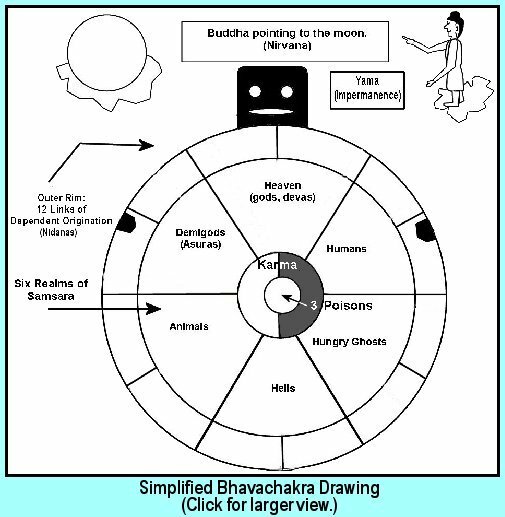 So, there is a brief survey of the bhavachakra, the "Wheel of Life." Unfortunately, going by what we see here, "life" is pretty unhappy, and heaven is only a temporary reprieve for the fortunate few. 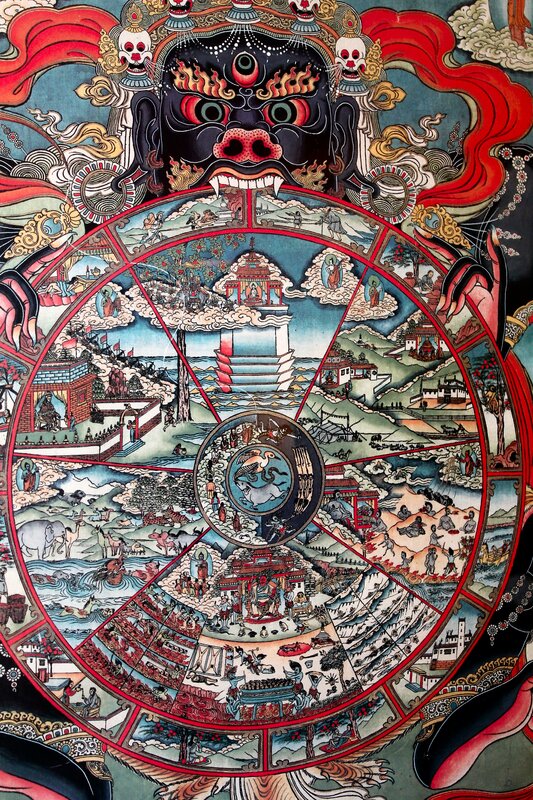 Thus, the wheel illustrates the first of the Four Noble Truths: "To live is to suffer." Now, we may not like this nightmare-inducing material, but it is important enough for us to include it very deliberately. To many people in the West today, Buddhism is a kind of hobby: something that they pursue as a pastime when they feel the need to pump up their spirituality a little bit. "Hey, what do you want to do tonight?" "Yeah. Let's go meditate. I really feel like I need that boost." "Good idea. With all the stress coming up next week, I can use a little extra dose of Buddhism myself." Needless to say, this is an absurd attitude. You cannot really practice a religion on a part-time basis when it suits you, however much some of its contents may appeal to you. You're only fooling yourself if that's your kind of Buddhism, and there are numerous people in the West who call themselves Buddhists for whom even the above conversation transcends the earnestness of their alleged faith. It doesn't work that way. Buddhism, like any other religion, is based on a total world view and wants to circumscribe all of our beliefs, actions, or attitudes. To follow a religion means to buy into a package because the individual constituent items of the package make no sense without the rest of it. To cull out only the parts that appeal to you is intellectually dishonest because you're claiming to follow a religion when you are really not doing so if you're actually rejecting its historical core. It is also spiritually self-destructive because you have chosen a "spirituality" of your own devising in favor of an honest quest for truth that transcends your life and your ability to deal with it. Anything that you have concocted yourself will be hemmed in by your own personal limits, and--if you'll forgive us for saying so--life is bigger and tougher than your own powers, particularly once you add a transcendent dimension. As you can see, for the Tibetan Buddhists their religion is not a relaxation technique, but an enterprise with, literally, consequences of life and death, something that is true of most religions in their traditional, non-watered-down, form. 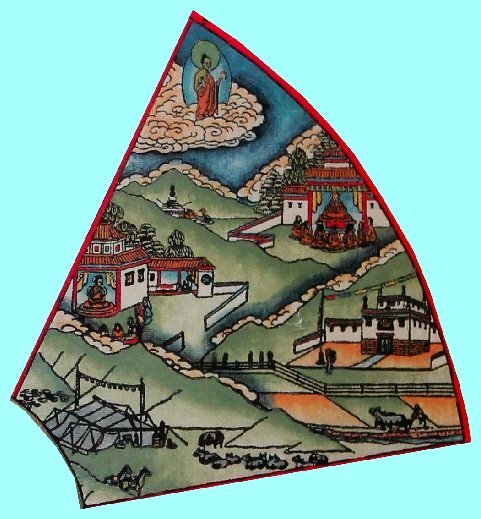 The idea of these realms is not unique to Tibetan Buddhism. Some Buddhist writings treat them as locations; others recognize them as states of mind. 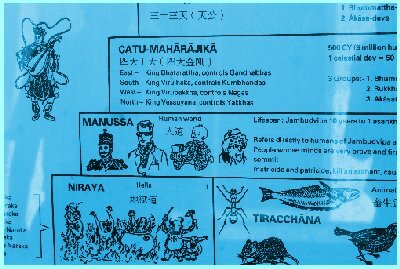 For example, on the left is a part of a diagram posted outside of a Thai Buddhist temple in Singapore. 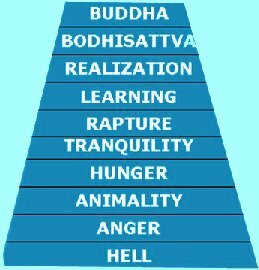 The pyramid on the right lists the mental stages a human being can go through to acquire Buddhahood by chanting in Nichiren Shoshu-Soka Gakkai. Interpreting the metaphysical cosmology in terms of states of mind does nothing to ameliorate their seriousness. It would seem that there is nothing better about your spiritual state being demonic than your being in a demonic place. Being an actual hungry ghost does not strike us as any better than living as a human being in outward appearance who is internally governed entirely by purely animalistic desires. There may be differences in details, but the basic cosmology--microcosm or macrocosm--is still there. These are hard words, but your eternal destiny is too important to treat it like a party game. Next we will look at some of the devices people use in Tibetan Buddhism to improve their karma.